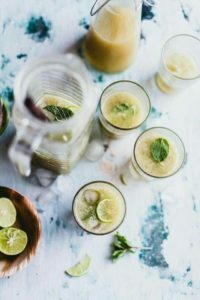 Come Summer, the season of thirst, get hydrate with delicious Hyderabadi flavour drinks to beat the heat and be healthy. 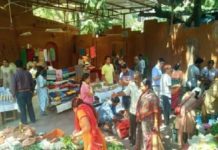 A summer day is overblown ten times in India. The Sun, once a trusted friend, is now unleashing its vengeance on the Indian populace. 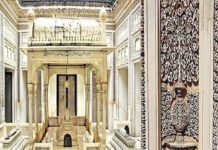 Summers in the city of Hyderabad are no lesser than in any of the other states. What do the people of Hyderabad do on a hot summer day? They cool themselves down with these yummy drinks. When the heat is draining out all your energy; there is no space for fancy colas and some such. If you want to beat the heat, Hyderabadi style, then gulp down this flavourful Lassi. 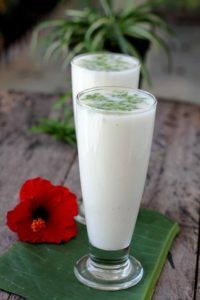 Hyderabadi Lassi is a special drink from the streets of Hyderabad and is a local favourite during summer. Curd, sugar and water are blended together to make this beautiful concoction. This is super easy to make at home too. Add a generous amount of nuts to it and serve chilled in a tall glass. You can also add rose water for that touch of luxury. Eat it or drink it, Falooda never disappoints. Traditionally it is made from mixing rose syrup, vermicelli, psyllium or basil seeds, tapioca pearls and pieces of gelatine with milk or water. 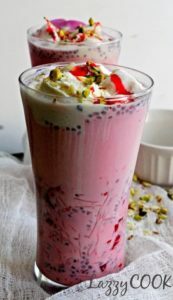 The basil seeds are known for their cooling properties and Falooda is eaten as a popular dessert in many households during summer in Hyderabad. No one can stop at just one glass of buttermilk. Did you ever compete with your sibling on a buttermilk drinking competition during those summer holidays? Spiced up or plain salted, this sure is the favourite summer drink of many. It’s refreshing and is great on a hot day. 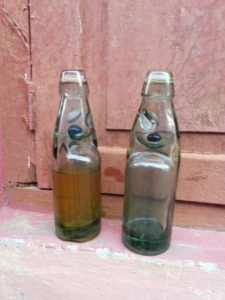 One can never forget the taste of this tingling drink. This carbonated lemon or orange-flavoured drink is popular throughout India. A perfect mid-afternoon drink to beat the heat! 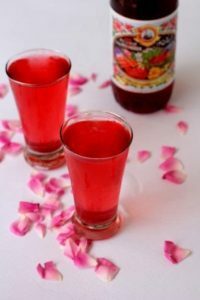 Roohafza is a rose flavoured drink that contains extracts from different plants and fruits. It has a complex flavour. A glass full of lassi with roohafza rejuvenates and makes you feel fresh. Roohafza can either be addeed to milk or yoghurt and had. 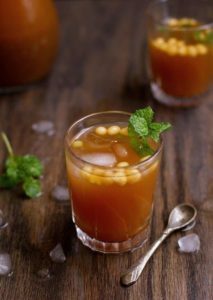 Jal Jeera is very cooling and is an ideal drink for hot Indian summers. The health benefits of Jal Jeera are manifold. Generally served as an appetiser, it is also a refreshing summer drink. 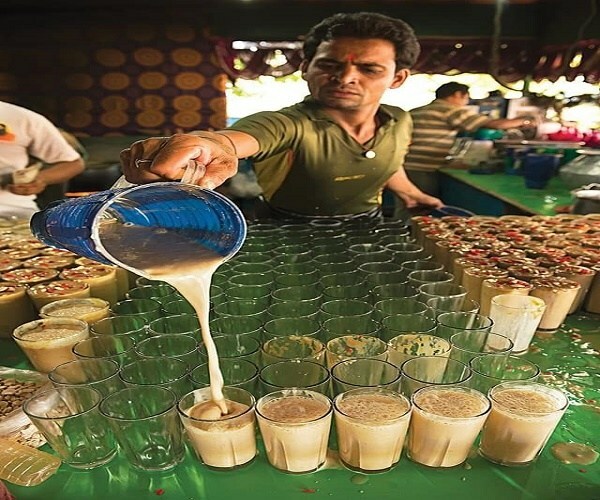 Irani Chai has always defined the café culture of Hyderabad. Introduced by Persian settlers, this drink has a special place in every Hyderabadi’s heart. A sip of chai on a summer evening will take away all the heat that’s been bothering you. 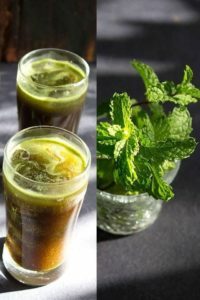 This is a lemon and mint drink that is a great summer beverage. The Sharbat wala can be spotted at the corner of every street of Hyderabad serving tall glasses of this delicious drink. One glass of it can do wonders to you. 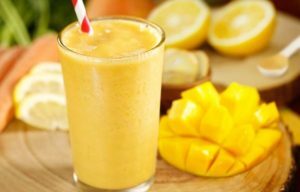 The real raw mango drink which is treated as a heat controlling agent in our body. It protects from sun-stroke and other sun burn ailments. This drink makes your body always away from Dehydration in summer days. Available this drink in selective places in old city areas. 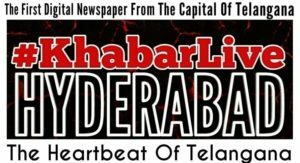 Previous articleWhy Nizamabad LS Constituency In Telangana Forced To Use On ‘Ballot Vote’?